ZombiU offers an interesting take on the survival horror genre, but its gameplay is sometimes more frustrating than fun. Going further, the game is marred by some unfortunate issues. Despite being a rather unrealistic scenario, the thought of a zombie apocalypse is something that ties into at least two of humanity’s underlying fears. Those phobias would be cannibalism and medical incompetence, the latter of which has been the reason for the rise of the undead in more than one fictional tale. As a collective group, we always worry about what we’re being injected with at hospitals and doctor’s offices, and for good reason. However, with that being said, it’s unlikely that a dangerous serum would make it through today’s rigorous quality control efforts. 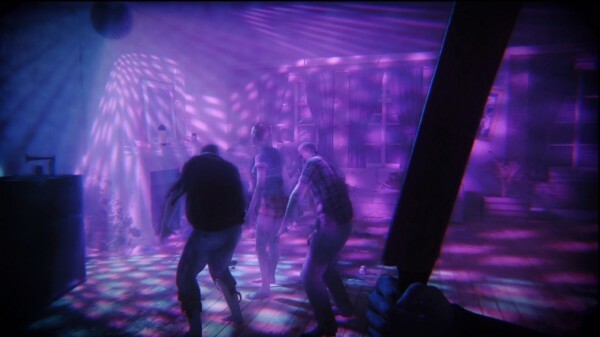 While we live in a society that will surely never see a zombie outbreak, the digital men and women who once inhabited ZombiU and its dangerous rendition of London weren’t so lucky. Somehow, the undead came to life around them, wanting brains and nothing more. Why did it happen? Well, some say it’s the result of an old prophecy, while others seem to think that the shambling corpses were infected by something. To avoid spoilers, I won’t go any further. However, I will note that the story that is presented is heavy on reading, and isn’t all that noteworthy. Instead, it acts as more of a backdrop, in order to provide an explanation as to why the troubled region’s survivors must venture out into local areas to fetch things, while taking on their undead foes through melee and bullet-based means. 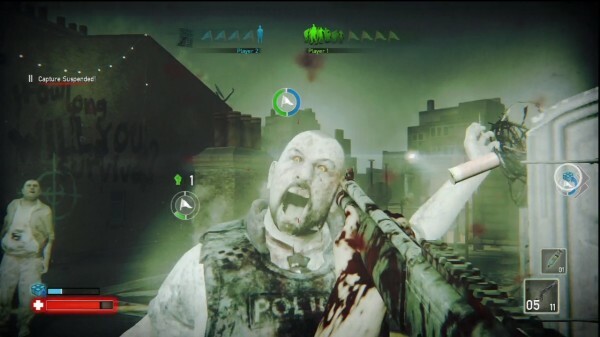 At its core, ZombiU is a survival horror game that utilizes both a first-person viewpoint and related combat mechanics. In order to succeed within its darkened alleyways and eerie subway terminals, one must learn to scavenge for supplies. That’s almost as important as avoiding combat is, because it’s best to sneak by enemies instead of startling them – especially when it comes to groups, which happen to be tough to deal with. However, that happens to be easier said than done – even if you do turn off your flashlight when you tiptoe by – and combat ends up being a necessary evil. Thankfully, you’ll always be equipped with a cricket bat, although its packed punch doesn’t compare to what the available firearms dole out. If you’ve previously delved into both of the aforementioned genres, then you’ll know what to expect: lots of searching and tons of close-combat encounters akin to Skyrim‘s warrior path. You’ll always be moving around the city, using sewer systems as fast travel pathways or taking the long route by foot. As such, you’ll want to make sure that you enter this in-game world with your proverbial walking shoes on, because there’s a lot of travel to be found within. Going further, you should also be OK with retracing your footsteps, because you’ll find a lot of back travel here. While the above descriptors may suggest similarities to Condemned, the fantastic Xbox 360 launch title that utilized similar combat mechanics, ZombiU is actually quite different because its focus isn’t on combat, and its heroes aren’t well trained. You see, every time you die, you’ll be playing as a different character. What’s neat about that is how different it is from other games out there, but it must be said that the design isn’t without its caveats. In fact, the positives barely outweigh the negatives at times, and frustration can set in quickly, thanks to difficult scenarios that bring Dark Souls to mind. As such, the goal is to see how long you can survive. Simply put, Ubisoft’s most anticipated Wii U launch title is a unique experience. There’s nothing like it, especially when you consider the way that it handles its unlimited protagonists. You can and will die a lot, thanks to limited health gauges and overpowering baddies, but you’ll always wake up as someone new. 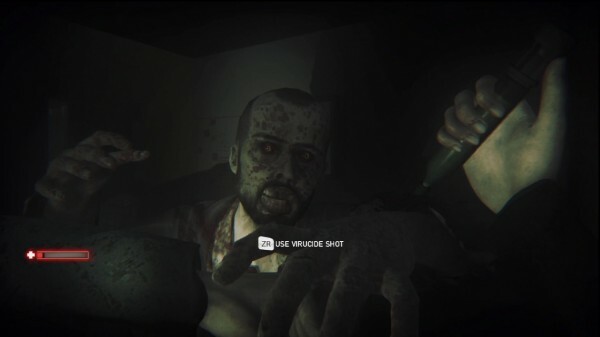 The punishment that comes with death in most video games still plays a major role here, however, as players must revisit the zombified or decapitated corpses of their past failures, in order to pick-up dropped quest items and miscellaneous supplies. That’s where a lot of the backtracking comes in, as you can surely imagine. You will want to go back for your dropped items, because it’s tough to deal with assorted baddies with only six pistol bullets and a cricket bat, the latter of which is the only melee weapon available here. Picking up pre-owned flares, grenades and Molotov cocktails is key, as is making sure that you have a health pack or two stored away for later use. Going further, it’s also important to keep your one syringe full of zombie poison, so that you can inject it into a creature as it’s about to go in for a one-hit kill bite. The majority of the items that players will find will come from the pockets of defeated foes. As such, looting plays a major role here. However, with that being said, some items and quest documents are hidden or locked away. In order to get at those, one must scan environments using the Wii U’s GamePad, in order to find clues and pass codes. You see, the touchscreen controller is a major survival asset, because it not only acts as your inventory and map, but also comes into play during gameplay. You’ll actually find yourself viewing it during rare turret and sniping sequences, not to mention hacking keypads and CCTV cameras with it. On paper, ZombiU sounds great. After all, it’s challenging and presents a unique twist on two different genres. While those two pros are certainly apparent, the final product is more polarizing than expected. As a result, certain types of gamers will love it, while others will find it to be merely OK, or will simply dislike it. I’m in the second category. Even though I went in thinking that this release would be my favourite Wii U launch exclusive, I ended up having a love/hate relationship with it. There were times where I was entertained and impressed, but those were countered by bouts of frustration and tedium, where I wanted to jump ship and play something else. Although this may sound strange, the best and worst things about this game come from its unique take on how one would survive a zombie apocalypse. While it’s fun to see how long you can remain alive as one living person juxtaposed against quite a few brain-eating corpses, the enjoyment wanes after a while. 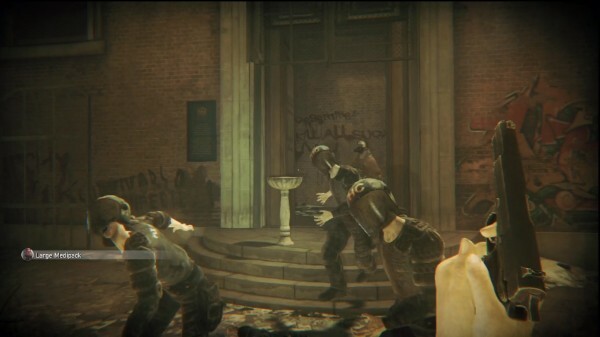 It’s at that point where the tedium of ZombiU‘s fetch quest focus comes into play. If more variety had been included, the experience would’ve been more entertaining, and would have been much easier to recommend. However, cheap deaths and a lack of direction take away from what could’ve been an amazing game. It’s also worth noting that, although it looks and plays quite well, this release doesn’t run or function as well as it should. You see, after playing for thirteen hours and making it to a point of no return, issues started to occur. To start, that’s where the frame rate became problematic, though that wasn’t the most frustrating problem that I encountered. What really annoyed me and made me question the developers’ intentions occurred after I died during that late section. As mentioned above, when you die, you’re someone new, which is fine. That’s the game’s shtick, after all. However, when my heroes and heroines perished after the aforementioned point of no return, I started to notice that things were changing for the worse. Previously unlocked gates in the safe house – which provides a regenerative bed and monitors that can be used to keep track of CCTV feeds – were locked, requiring hacking or touchscreen lock picking. After that, I noticed that a lot of the fast travel manholes I’d opened had been closed, and were inaccessible. However, it at least let me travel to the one I needed to get to. That was, until I hit what seems to be a brick wall. While looking for a way to escape a darkened maze of rooms and ventilation shafts, my heroine fell into a room and died. When I woke up, I immediately wanted to search for her, but discovered that all of the manholes had been reset. That meant a lengthy trek through dimly lit and boring environments I’d already traveled through, and had cleared of most of their zombies. Despite my frustration, I gave in and began walking, not expecting that I’d come across more than one group of zombies on each pathway. I’d expected one or two stragglers, but not that many, because previously cleared areas normally don’t re-populate much. Unfortunately, that wasn’t the case then. After battling through the hordes to get to the area in question, I had some trouble finding my previously assumed character. To be honest, I still haven’t found her, and I’m not sure if it will be possible, despite her green icon. It didn’t seem like there was a door attached to where she fell, so I may be out of luck. However, I will keep trying, because she has one major quest item that is required for progression. Of course, I wish that the developers had included some sort of a fail safe, which would allow me to restart the objective or something of that sort. Perhaps they could try to do that through a patch, though, because it’d be nice to finish off what I started without having to deal with hours of frustration. Even getting back there without fast travel was a pain, and more than a couple deaths were incurred along the way. That’s enough about the campaign. Now, it’s time to talk about the bonus modes, of which there are two. First up is an application that allows players to turn themselves into zombies by using the GamePad’s front camera. It’s neat and works, but certainly isn’t a selling feature. Then again, the core experience is what will sell this game to those who are interested, because, while its supporting multiplayer scenarios are interesting, they don’t support online play. Instead, one player gets to be the King of All Zombies, while another Wiimote and nunchuk handling user assumes control of the survivor. The result is a competition that aims to see how well the human character can do against spawned zombies. It’s important to mention that there are actually two competitive modes. What could be referred to as the core mode is a point capturing exercise, while the other predominantly focuses on survival. Please note that a survival scenario is also available within the main campaign, allowing users to see how long they can last as one character. Those who decide to test their mettle against it will hope for leaderboard supremacy, although they’ll have a difficult task to deal with. When it comes to presentation, Ubisoft’s much-anticipated and genre-melding launch title isn’t a slouch. It looks quite good and has some nice elemental details, which are more evident in lit areas. Then again, light is a limited resource in this apocalyptic take on London, and you’ll mostly be traveling in the dark, with a weak flashlight at hand. 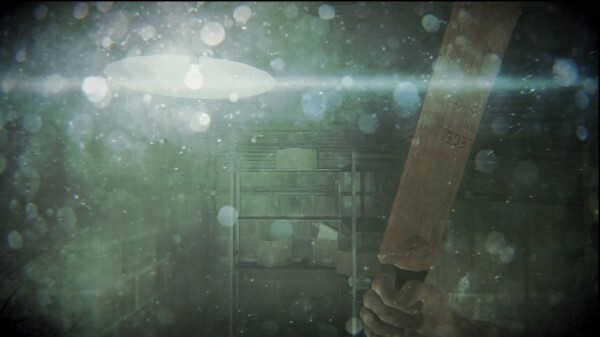 As a result of that, plus the inclusion of spooky sound effects and musical tones, there’s quite a bit of eerie atmosphere to be found within this experience. With that being said, there are three notable downsides that mar this facet of the game, and those are frame rate hiccups, repetitive character models that aren’t as impressive as they could have been, and an unfortunate crashing bug. Luckily, I was only forced to turn off and restart my system once as a result of a crash. Honestly, I wish I would’ve enjoyed ZombiU more, but the fact is that it’s not really for me. While Ubisoft Montpellier’s latest effort certainly isn’t a bad or poorly made title, it’s sometimes more frustrating than fun. Granted, if there were less fetch quests and fewer issues, it would be easier to recommend this interactive survival test to more people. However, as it stands, I cannot recommend this polarizing experience to just anyone. If you’re interested in picking it up, that’s great, but do your homework first. This review is based on a Wii U copy of the game that we were provided with.